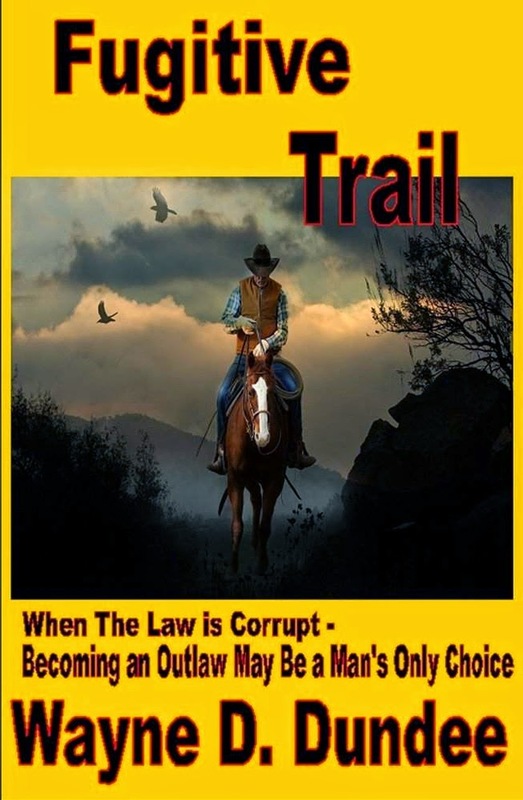 Wayne D. Dundee's novel FUGITIVE TRAIL is in the running for a Peacemaker Award this year, and well it should be, because it's a fine traditional Western novel. Like a lot of Civil War veterans, Eli Cole has come home to find his world ruined. He heads west, hoping to find a new home on the frontier, but he carries with him a price on his head because of a shooting in which he was involved. Starting out, his only companion is his dog Shadow, but he soon becomes involved with a small group of travelers heading for Colorado. The party is led by a minister who plans to spread God's word to the miners in the Rocky Mountains, so Cole with his violent ways doesn't really seem to fit in with the group. But with trouble dogging all of them, Cole and his gun may be just what they need. As usual with a Dundee novel, the characters are human and well-drawn, and there's plenty of hardboiled action. Eli Cole is a very sympathetic protagonist, so the reader can't help but hope that he'll eventually find some happiness. FUGITIVE TRAIL is a fine example of Dundee's work and ample evidence of why he's one of today's most popular and highly regarded Western writers. If I were looking in the bookstore for a western it would be the cover that would catch my eye. I'm a sucker for a good cover. Sadly, with this one I doubt I would pick it up because the cover does not grab my eye at all. I know we aren't supposed to judge a book by its cover but visuals rivet my eyes which usually converts to money being pulled from my wallet. It could be a reasonable idea, Rick, to suppress your inclination to be a "sucker" and perhaps try doing what you're "supposed" to do and not "judge a book by its cover." In the case of a Wayne Dundee novel, such personal prejudice serves only to deprive you of the work of a damn good writer. Cover looks just fine, IMHO. I can see your reasoning Stephen. My only problem is I love the illustrations that bygone artists used to produce for the pulps and early paperbacks. It's my wish that more publishers would return to those incredible scenes envisioned by those who can bring a story to life with color and action in a singular representation of what is between the covers. It's art enhancing art. James - Thank you for the nice review and kind words. Steve - Thanks, also, to you for your supportive comments. Rick - I can't disagree that a good cover is preferable and important. Yet sometimes it is a matter of taste, sometimes one of resources. And your comment about "bygone artists" seems to recognize that those grand old illustrations are pretty scarce these days. Like I said, it's a matter of taste; frankly, I think the cover in question here ain't all that bad ... surely worth a gamble of 99-cents if looking for something to read is part of the deal. I bought a copy, just to let you know. Of course it has be placed on my to read list which is "stacked to the ceiling." I meant no disparagement of your novel. I was just saying my eyes are drawn to color splashed paintings on covers. I bought copies of SCARAMOUCHE, CAPTAIN BLOOD, and THE SEA-HAWK, though I have 2 copies of each, simply because the new editions had exciting paintings for covers. So, it's simply my addiction to good illustration that makes me say such. I will get to FUGITIVE TRAIL as soon as I can. I'm happy to buy as an encouragement to writers and illustrators. I learned about two important things in your posting: (1) worthwhile author; (2) reputable prize. Even though most of my reading is crime-detective-mystery fiction, I also plunge every now and then into westerns. So, thanks for the valuable new information. BTW, I have just begun a new blogging venture at Crimes in the Library. I hope you will stop by every now and then for a visit. Today's debut posting features a couple of questions. Please weigh in with some answers.